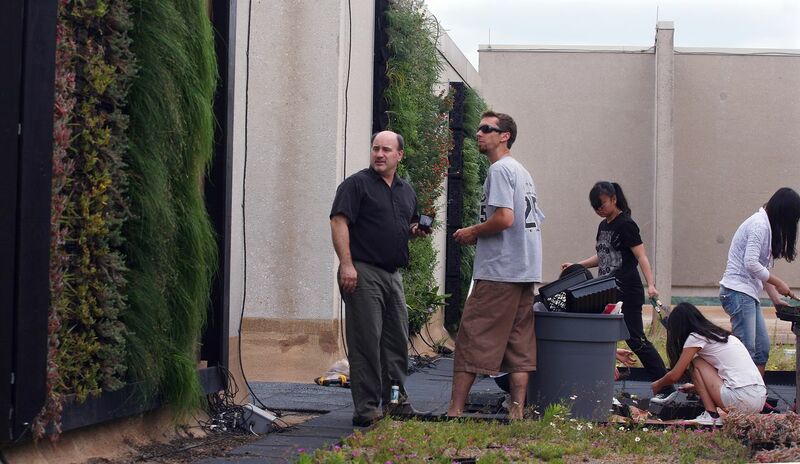 Students recently planted an assortment of new greenery on the rooftop on Building A of the Langford Architecture Center, part of an ongoing research project at Texas A&M University to learn what plants will thrive on green roofs and green walls in Texas’ often hostile climate. Green roofs and green walls promise many benefits, including lowering a building’s energy use, cleansing stormwater and improving air quality as well as providing aesthetic benefits and higher property values. Since the project began in 2012, Bruce Dvorak, assistant professor of landscape architecture, said he has identified more than a dozen module-planted species that have done well on the Langford roof. However, finding plants that will thrive in a green wall setting has been more of a challenge; none of the plants in the green wall portion of the project survived the cold 2013-14 winter. A successful green wall hasn’t yet been planted in Texas, said Dvorak.